Front row; Melissa Frerking, Billy Brown, Sadie Inlow, Coach Dewayne Day, Salara Inlow, Dawna Travis, Emily Story. Back row; William Shockley, Trevor Disberger, Seth Summers, Joe Gash, Collin Hagan, Fletcher Johnson. Not present, Stephen Payne. 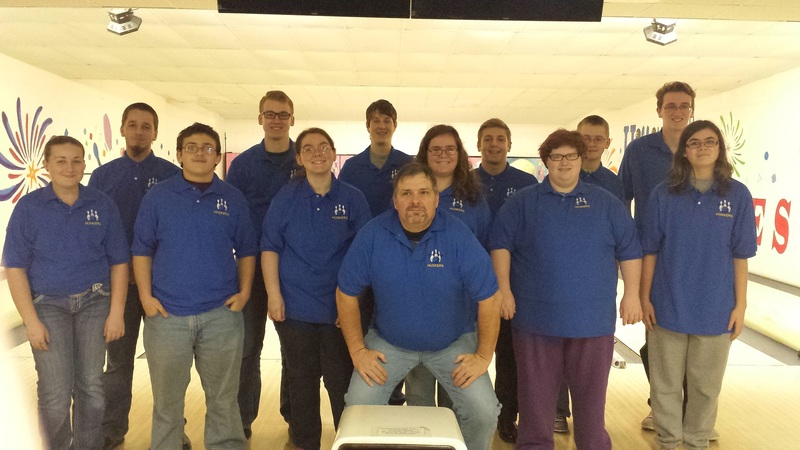 The Lafayette Co C-1 Huskers Bowling Team, has formed and has started practices and will competing against Concordia and Warrensburg this year. They will be bowling baker style games. The team went to Concordia last weekend, February 14th and will match up at Higginsville Lanes Sunday February 21st, at 10am then to Warrensburg on February 28tth and again at Higginsville Lanes on March 13th. Zone will be in Concordia on March 26th. The zone runner up can attend the Mid-American High School Handicap Tournament in Crestwood Bowl, St. Louis MO Arpil 30th. The winner of Zone will advance to the state finals in Springfield, MO May 21st.